Since its recent launch in the US, Spotify has left listeners elated, with unprecedented open-access to tracks from independent and major labels. But if you’re an artist or songwriter, you may be wondering how those Spotify streams turn into royalty payments and ultimately end up in your back pocket. There are music publishing royalties generated from each stream on Spotify. Capturing each of these will help maximize your earnings. Songtrust gets you paid all your Spotify money. Find out how! The public performance or broadcast of a musical work generates a performance royalty for the songwriter and publisher. These royalties are collected by performing rights organizations (PROs) - ASCAP, BMI, SESAC. Your songs must be properly registered with a PRO to be paid this royalty. For those new to the music biz and yet to register with a PRO, Songtrust can streamline the process and maximize your relationship with each. 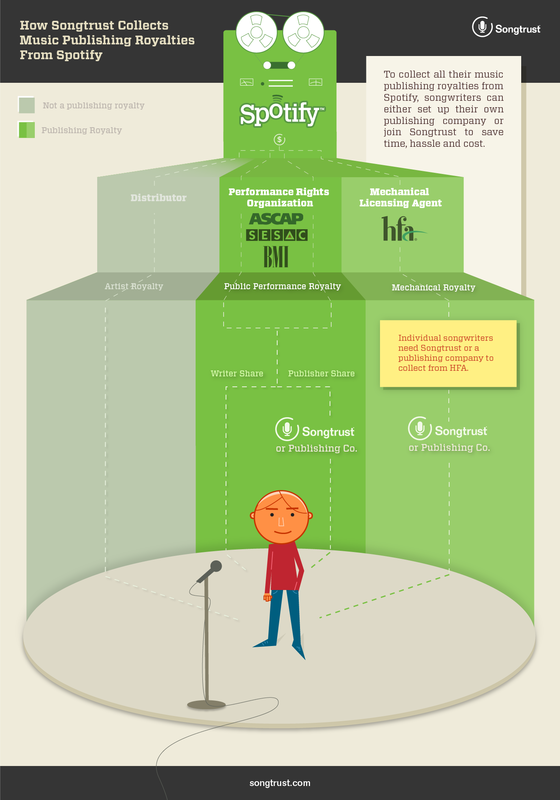 Performance royalties are based on each songwriter’s ownership share of the song. For example, if you play in a guitar-and-drums garage rock duo, and both members contributed equally to the song, the ownership shares would be 50% and 50%. However, the ratio can vary depending on an agreement between songwriters to weight the shares in favor of a primary writer. The performance royalty is also split and distributed equally between the songwriter(s) and the publisher(s), with each being allocated 50% of the performance royalty pie. Depending on what type of deal you have with your publisher (administration, co-publishing, income particiapation) you may actually only see a portion of those performance royalties. 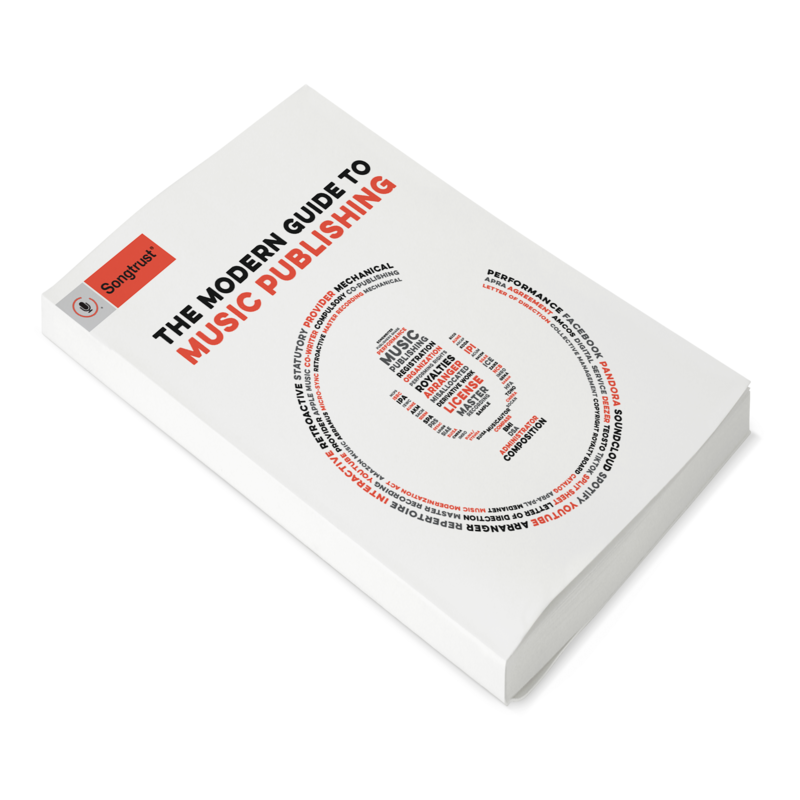 Songwriters that handle their publishing rights through Songtrust will see 100% of the publisher's share of performance royalties distributed back out to the writer(s). These royalties are generated when your songs are reproduced, retransmitted or rebroadcasted. This occurs when outside parties license your songs for physical albums, digital downloads and interactive streams. In the case of Spotify, the Harry Fox Agency (HFA) provides customized administrative services and issues mechanical licenses on behalf of its 45,000+ represented music publishers. HFA collects the mechanical royalties owed by Spotify to the publishers for the use of their music on the service, and then pays that money to each publisher. If your songs do not have a publisher, Songtrust is able to collect on behalf of songwriters without a publishing company - saving money, time and hassle. Alternatively, you can start your own publishing company and register with HFA to collect mechanical royalties. Songtrust can collect Spotify royalties and much more. Get started!